While staying at the Rhapsody Resort Wisconsin Dells you will be treated to a vacation you won’t soon forget. My husband and I will fill you in on our stay at the resort as we fell in love with the striking interior and exterior design of the units and the numerous amenities. 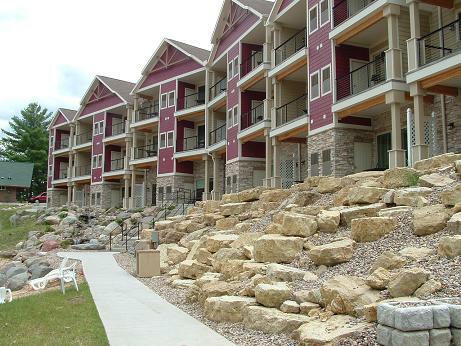 The exterior design of the building consisted of several earthy elements such as wood shakes, sandstone, waterfalls, rock wall terraces, beaches, and of course Lake Delton. Parking for the 2-4 bedroom units have either a heated underground or a typical two car garage. Very few Wisconsin Dells Resorts have a location directly on Lake Delton. The Rhapsody Resort Wisconsin Dells has hundreds of feet of frontage that raps around a point offering two sand beaches. In addition to the beach areas the Resort has slips and piers to swim, fish or boat from. We chose to stay in one of the ten theme suites which host names such as Vegas Baby, VIP Lounge, Hog Wild (Harley fan’s), Surf’s Up and African Safari, to name a few. Our theme room was “London Bridge“ and we were immediately greeted by a large English fox hunt mural leading to a beautiful four poster bed, and a bright red English phone booth like you see in the movies. The room also had an oversized whirlpool tub, computer station and a wet bar all on a uniquely finished real wood floor. The wet bar sported a state of the art refrigerator, microwave, coffeemaker and two wine glasses. Just remember to BYO wine or champagne! The bathroom was another experience on its own merits. The floors and walls were all a beautiful natural stone material. The oversized shower was again all made of natural stone and was large enough for a whole family. The shower was very relaxing with the four body massaging water heads. As an added feature we made use of the complimentary toiletries and we were treated to shampoo, conditioner and shower gel made in France that had a unique fragrance. There is a large centrally located building with a recreational area which includes an indoor pool, sauna and exercise room. A heated outdoor pool is located behind the penthouse units and the terracing and views are outstanding! And of course you also have the option of boating and swimming from the sand beach on the lake. For overnight rentals Rhapsody Resort offers everything from theme rooms to one bedroom suites, two bedroom residence, three bedroom lakefronts or a four bedroom penthouse. Any unit with two or more bedrooms are equipped with washer and dryer. The penthouses have enormous decks with sunset views. When you call make sure you ask what they might have available for discounts or specials. Our next stay here will include their full scale spa, which offers everything from aromatherapy massage to pool cabana massages. Enjoy your stay and don’t forget the wine and marshmallows!